A presentation by Jerry Morris before the Florida Bibliophile Society on Sunday, March 22, 2009. There are people in this room, myself included, who, in days gone by, have suffered from a disease which Eugene Field called "catalogitis." Each day, we would check the mail, hoping for either a catalog from one of our favorite booksellers, or for the most recent issue of AB Bookman's Weekly. We would then spend hours and hours poring over the offerings listed in the catalogs. Today there is a different kind of malady which bears the name, catalogitis. I have that disease as well. But instead of reading catalogs about books for my library, I am cataloging books from dead people's libraries. In December 2007, I joined Library Thing and cataloged my entire library on their website. The next month, Dave Larkin, a bibliophile from the Cape Cod area, invited me to join a group called "I See Dead People's Books." This group, plain old bibliophiles just like you and me, catalog the libraries of famous people who are deceased. Dave contacted me because I had the largest Samuel Johnson collection on Library Thing. He wanted me to help him catalog Johnson's library online, a feat that had never been done before. We have been cataloging ever since. After we finished cataloging Johnson's library, we cataloged Charles Lamb's library. Currently, we are cataloging James Boswell's library. Each library presented unique challenges. The greatest challenge to cataloging Samuel Johnson's library was the auction catalog itself. One Johnsonian, Donald Greene, said, "It is quite possible that this 28-page pamphlet can claim the distinction of being the worst catalogue ever produced." Lot Number 2. 12. L'histoire de France, par Mezeray, 7 tomes &c.
By far, the most frequent notation in the entire catalog was the symbol for the phrase, "et cetera." Lot number 2 calls for 12 books, 7 of which were supposed to be for Mezeray's History of France. There were several editions of this work published, but the largest edition only contained three volumes. That leaves 9 books unidentified for lot number 2 and 11 book unidentified in lot number 1. All told, only 1/5 of the 3000 books sold at the auction were identified by title in the catalog. Total prices realized was a measly £247.9, or, roughly, 19 pence per volume. On the brighter side, it was better than the £85 an enterprising bookseller offered for the library! "... the books shall be distributed into their distinct classes, and every class ranged with some regard to the age of writers; that every book shall be accurately described; that the peculiarities of editions shall be remarked, and observations from the authors of literary history occasionally interspersed; that, by this catalogue, we may inform posterity of the excellence and value of this great collection, and promote the knowledge of scarce books and elegant editions. For this purpose men of letters are engaged, who cannot even be supplied with amanuenses, but at an expense above that of a common catalogue." Maybe Christie, the ex-navy man should have been made to walk the plank? Maybe Johnson's executors as well? To better catalog Johnson's library, Dave Larkin used Donald Greene's book, Samuel Johnson's Library. An Annotated Guide, published in 1975. It wasn't long before I acquired a copy of Greene's Guide as well. Together, we searched the holdings of over 600 university libraries on Library Thing for the titles Greene identified. We selected the appropriate editions, and included remarks or reviews of the books whenever possible. Searching the university titles by author was difficult, especially for the Latin and Greek books, because the names of the authors were spelled differently than the way we spell them today. For instance, I found Homer spelled as Homeri with one i, Homerii, with two i's, and Homerus with no i's. If we guessed right on the spelling of the name, the library at Oxford was the best source since one could enter the author's name, a few words of the title, the date of publication, and presto! After a few moments, the listing would appear. Dave was good at combing such references as Boswell's Life of Johnson for comments Johnson made about particular books. For instance, "Burton's Anatomy of Melancholy, he said, was the only book that ever took him out of bed two hours sooner than he wished to rise." As a finishing touch, we would try to find images of the title pages online, and insert them in the listings. In some cases, we would insert images of title pages from copies of books in our own libraries. Johnson's library contained much classical literature, both Greek and Latin: Aristotle, Homer, Plutarch, Pindar, Horace, Seneca, Cicero, and many names I don't recognize. He had books on English literature, and French, Italian, and Spanish Literature. He had grammar books, dictionaries, poetry books, and books on science, law, medicine, philosophy, and religion. Although the catalog says he had the 1623 First Folio edition of Shakespeare, that was incorrect. He had the 1632 Second Folio edition and the 1664 Third Folio edition. Samuel Johnson shared at least 163 books with Thomas Jefferson, 69 books with John Adams, and six books with me. In his Guide, Greene referred to four previous articles on Johnson's library, written by C.W. Hutton, Austin Dobson, Percy Hazen Houston, and Sir Sydney Roberts. Hutton's paper, "Dr. Johnson's Library," was published in the 1899 edition of <>Johnson Club Papers By Various Hands. Greene felt that Hutton's paper was a "short, chatty essay" that was too "clubbable." In Hutton's defense, I must say he was instructed to limit his talk to "a quarter of an hour, less if possible." Austin Dobson's essay, "Johnson's Library," was first published in his book, Eighteenth-Century Vignettes, Second Series in 1894. Greene felt Dobson's article was also too “clubbable." Percy Hazen Houston imposed his own limitations. In his "Appendix: An Account of the Sale Catalogue of Dr. Johnson's Library." Houston sorted the books in Johnson's library by category, whereas Greene sorted them by author. But Houston didn't feel it was necessary to include any of Johnson's books on science, law, medicine, religion, or philosophy. Consequently, Houston eliminated 440 of the 760 books listed by title in the catalog. Houston's appendix was included in his book, Doctor Johnson, a Study in Eighteenth Century Humanism. Sir Sydney Roberts 's essay, "Johnson's Books," Greene felt, was the most scholarly of the four works. Even so, Greene thought Roberts was too concerned with the provenance of the books and not with the books themselves. Roberts's essay was included in his book, An Eighteenth-Century Gentleman and Other Essays, published in 1930. The title of this book is the title of the first essay in the book, which is not about Johnson; it is about Lord Lyttleton. When Greene was finishing the first draft of his Guide in the 1970s, he heard about J.D. Fleeman's work on Johnson's books, sought his assistance, and included Fleeman's corrections and additions to the present Guide. Fleeman wrote a companion volume to Greene's guide, a facsimile of another copy of the auction catalog. Fleeman, you will later learn, played a part in our future research of Johnson's library. Accordingly, in May 2008, we cataloged the last book listed in Greene's Guide, and called our catalog complete - except for books that would be identified through additional research. Greene's Guide had been our Bible. And Greene wrote his Guide not for the Johnsonian scholar, but for the student of Johnson. He limited the scope of his Guide to identifying books listed in the auction catalog. He spent little time tracing the provenance of the books, a study he admitted would be beneficial, but said he had neither the time or the expertise to complete it. Greene also imposed limitations on what he told us about the information in the four articles on Johnson's library. What he did not tell us was that two of the four articles contained a list of books possessed by Johnson which were dispersed by the executors of Johnson's will. A copy of one of these four books, Austin Dobson's book, was in my own library. But I had not read the essay in years. It would be weeks before I happened to take the book down, and discover the list. Examine Samuel Johnson's own writings. Read Johnson's personal letters to see which books and authors he discussed. Examine the letters of Johnson's friends. Locate the actual volumes Johnson owned. Find out to which books Johnson subscribed. Identify which books Johnson reviewed. My humble opinion at the time was that these suggestions were for scholars and not for bibliophiles who suffered from catalogitis. Within weeks, though, we were using some of these tactics to identify books in Charles Lamb's library. Within months, we were using them to identify books in Boswell's library, and additional books in Johnson's library. Once we completed the last entry of Greene's Guide, I invited Dave Larkin to help me catalog the library of Charles Lamb! 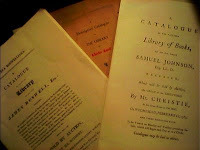 I had a copy of the Descriptive Catalogue of the Library of Charles Lamb that was published by the Dibdin Club in 1897. This was Vincent Starrett's copy, by the way. I had read some of Lamb's letters, and he interested me. I thought cataloging his library would be fun, and also less challenging than cataloging Johnson's library. Boy was I ever wrong! Charles Lamb died from a bad fall in 1834. His books were bequeathed to his friend, Edward Moxon, the bookseller. But Moxon did not take possession of the books until Lamb's sister, Mary, died thirteen years later. In the meantime, some of the books went out the door, under the arms of Lamb's friends. In 1848, Moxon went through the remainder of the books, selected "upwards of sixty" - remember that phrase - of the best volumes, and destroyed the rest. At least that is how the story goes. Moxon had good reason to destroy some of the books. Charles and Mary Lamb liked to cut engravings and portraits of authors out of their books and paste them on the walls. One of Moxon's friends, Charles Welford, convinced him that Lamb's books would sell better in America. Welford brought the books chosen by Moxon to the United States in 1848. They were individually sold at the store of Bartlett & Welford in the Astor House in New York. They sold rather quickly. The list of books was published in The Literary World in 1848. An enterprising auctioneer convinced some of the buyers to put their books up for auction. Eighteen of the 60 lots went on the auction block in October, 1848. But most of them sold for less than what Welford the bookseller sold them for. "The history of Lamb's books is more humanly interesting than the history of the Huth or Grenville library; as chattels or furniture they were worthless; they were generally the poorest copies imaginable, but if they did not cost money, they often cost thought; they sometimes involved a sacrifice, if the price was in the high altitude of a sovereign. In the case of Lamb, the sister's opinion was sought, and the matter lay ever so long in abeyance before the final decision was taken, and Lamb hastened to the shop, uncertain if he might not be too late, if the person whom he saw emerging as he entered might not have 'his' book in his pocket. Here was payment in full for the prize; the coin handed to the vendor was nothing to it; Lamb had laid out more than the value in many a sleepless night and many an anxious calculation. Lamb, although he never bound a volume in his own life, or purchased one for the sake of its cover, could grow enthusiastic over his favourite Duchess of Newcastle, and declare that no casket was rich enough, no casing sufficiently durable, to honor and keep safe such a jewel. "I looked over Lamb's library in part. He has the finest collection of shabby books I ever saw; such a number of first-rate works in very bad condition is, I think, nowhere to be found"
"...Among all your quaint readings did you ever light upon Walton's Complete Angler? I asked you the question before [June, 1796]; it breathes the very spirit of innocence, purity, and simplicity of heart; there are many choice old verses interspersed in it; it would sweeten a man's temper at any time to read it; it would Christianize every discordant angry passion; pray make yourself acquainted with it." A gentleman I never saw before brought me your welcome present - imagine a scraping, fiddling, fidgeting, petit-maitre of a dancing-school advancing into my plain parlour with a coupee and a sidling bow, and presenting the book as if he had been handing a glass of lemonade to a young miss - imagine this, and contrast it with the serious nature of the book presented! Then task your imagination, reversing this picture, to conceive quite the opposite messenger, a lean straight-locked, whey-faced Methodist, for such was he in reality who brought it, the genius (it seems) of the Wesleyan Magazine." It wasn't long before I realized that Edward Moxon didn't destroy all of the books like they said he did. W. Carew Hazlitt, whose father was one of Lamb's friends, came out with a list of Lamb's books which had remained in England. This list was included in his 1874 book, Mary and Charles Lamb. There were errors in this list because Hazlitt didn't have the opportunity to review the proof copy before publication, so he amended the list and included additional books belonging to Lamb in his 1897 book, The Lambs: Their Lives, Their Friends, Their Correspondence. When he identified additional books from reviewing his father's papers, he included them in his 1900 book, Lamb and Hazlitt; Further Letters and Records Hitherto Unpublished. I also discovered that I wasn't the first person to read Lamb's letters and identify books he discussed. E.V. Lucas did that long before me, and provided a list of books belonging to Lamb in his 1906 book, The Life of Charles Lamb. Lucas also provided a list of authors whose books he believed may have been in Lamb's library, but did not provide any of the titles. In a November 1827 letter to his friend, Bernard Barton, Lamb wrote, "One likes to have one copy of everything one does." Accordingly, I cataloged everything Lamb wrote from my copy of Renee Roff's book, A Bibliography of the Writings of Charles and Mary Lamb. My cataloging partner, Dave, was doing quite well with the Descriptive Catalogue. Compared to Johnson's catalog, it was far superior, but it could have been better. "Upwards of 60" - do you remember that phrase? In truth, there were quite a bit more than 60 works in Lamb's library. Lamb had many of his tracts, plays and poems bound together. Entry number 53 contained 11 miscellaneous tracts bound in one volume, only one of which was identified. Entry number 34 contained 15 works of minor poets bound in one volume, only two of which were identified. All told there were over 100 tracts bound in ten volumes, many of which were unidentified. Charles Lamb shared at least 10 books with Samuel Johnson, 22 books with Thomas Jefferson, 8 books with John Adams, and 8 books with me. We were able to trace the provenance of some of Lamb's books and manuscripts from researching on the web, and from researching some of the books in my own library. Dave traced The History of Philip de Commines, Knight, Lord of Argetan from the Welford sale in 1848 to the Charles Scribner Collection of Charles Lamb at Princeton University Library. I traced the autograph manuscript of Lamb's Dream Children from an auction in England to a bookstore in Boston. Dream Children first appeared in print in the January 1822 issue of The London Magazine, and was included in the first edition of The Essays of Elia in 1823. Lamb wrote the essay shortly after his brother John died. The original title was My Children, but Lamb reconsidered, and thought Dream Children would be a better title for a bachelor. It is considered the most beautiful of Lamb's writings. The autograph manuscript first appeared at a Sotheby's auction on May 10th, 1892, where Stuart M. Samuel, an English politician acquired it for £57. He bought it purely as an investment. It next appears at the July 1, 1907 Sotheby's auction of Samuel's library, where A. Lionell Isaacs, a bookseller from Pall Mall, bought it for £108. Harry B. Smith may have been the next owner because Dream Children appears in his Sentimental Library, published in 1914. For years, Smith bought presentation copies and association copies of famous authors. But when millionaires started to spend vast amounts of money on books and libraries, he could no longer compete. He sold his entire collection to A.S.W. Rosenbach for $79,000 in 1915, ten times what he paid for them. Later on he would say the books were worth millions. Rosenbach sold it to A. Edward Newton, where it became "The Golden Crown" of his Charles Lamb Collection. The manuscript next went to Mrs. Landon K. Thorne, the noted William Blake collector, who paid $7,500 for it at the Newton auction in 1941. The manuscript next surfaces at a bookstore in Boston, Bromer Booksellers, where it is currently being offered for $85,000. Bromer Booksellers reportedly acquired it "at a country auction." I am surprised that Mrs. Landon K. Thorne did not bequeath the manuscript to either Princeton University Library or the Pierpont Morgan Library because she bequeathed items to both libraries. Princeton has the Charles Scribner Collection of Charles Lamb. And Pierpont Morgan already had the autograph manuscript of Lamb's Dissertation On Roast Pig. Dream Children would have been a nice companion. If Princeton and Pierpont Morgan had some of Lamb's books, I knew other libraries had copies as well. I had already cataloged Lamb's books from the Houghton Library at Harvard. So in June 2008, I queried the librarians via the exlibris mailing list on the web. I was amazed by the response. The following libraries reported they had at least one book from Charles Lamb's library in their holdings: Cambridge University in England, the Dunedin Public Library in New Zealand, Boston Public Library, the John Hay Library at Brown University, the Lewis Walpole Library at Yale University, the Spencer Research Center at the University of Kansas, the Harry Ransom Center at the University of Texas at Austin, the University of North Texas, and the Lilly Library at Indiana University. Many of these books were "Relics of Charles Lamb. Purchased at Edward Moxon's Sale by Francis Jackson" - at least that's what the bookplate said that was pasted in each book. Remember Edward Moxon? He was the bookseller/friend to whom Lamb bequeathed his books. I was vaguely familiar with the phrase, "Relics of Charles Lamb." Luther Brewer mentioned it in My Leigh Hunt Library: The First Editions. In the listing for Flora Domestica, a book for which Leigh Hunt provided the poetry, Brewer duly recorded that the book was bought at Moxon's Sale. Then Brewer added a note from his friend, Edmund Charles Blunden, who wrote a book or two on Lamb and Hunt: "Mr.Blunden doubts this, saying that Jackson was accustomed to make all sorts of claims that were false. A similar doubt had been raised recently by a California bookseller selling a nonce collection of plays "supposedly" once owned by Charles Lamb. In the listing, the bookseller, John Windle, reported that a number of such Relics acquired by Harvard after the sale of the estate of Jackson's grandson showed no proof that they were from Lamb's library. Interesting? I could and will do a whole paper on the "Relics of Charles Lamb." But not today. I will tell you that the Moxon Sale is not mentioned in Harold Merriam's biography of Edward Moxon. Nor has a copy of a catalog of the Moxon Sale ever been found. I did locate a copy of the auction catalog of the grandson's estate at the Victoria and Albert Museum of the National Art Library. The librarian, Kirsten Pairpont, was kind enough to send me a copy of Jackson's Lamb Collection, 116 books bought by the London bookseller, Thomas Thorp, in July 1923 for 4.4£s. Unfortunately, the books are not identified by title. You can learn more about Charles Lamb, the Jacksons, and these so-called relics in Claude A. Prance's book, Companion to Charles Lamb. In Reginald Hine's book, Charles Lamb & His Hertfordshire, you can read about the Relics that Reginald Hine owned, and which his wife presented to the Charles Lamb Society, of which he had been a member. I must relate one anecdote about Hine, though. In October 1948, he heard that one of Lamb's Commonplace-Books from the Rowfant Collection was being offered at Sotheby's. Hine went to Sotheby's before the auction and examined the manuscript. It contained Lamb's notes on Shakespeare, Ben Jonson, Beaumont and Fletcher and others. Hine wanted that book! On the way out he bumped into the bookseller, Percy H. Muir, from whom he had acquired some of the Relics. Together they concocted a plan that, hopefully, would make Hine the next owner of Lamb's Commonplace-Book. Muir was to wear his best suit and, in the auction room, act like an agent who was representing a millionaire. Muir played his part well. Maggs Brothers and other booksellers stopped bidding because they didn't think they could compete with the money that Muir was representing. All the while, Hine was in his office giving lawyerly advice to a man who's wife had just left him. The man literally jumped when Hine answered Muir's telephone call and shouted, "this is terrific!" Muir won the auction for £220! We called our cataloging of Lamb's library complete in the latter days of September of 2008, except for books we could later identify. On October 2nd, we began cataloging the library of James Boswell. Anna Ritchie, a bibliophile from Scotland joined us in the fun. We also had my friend, Ed Schaeffer, the James Boswell collector and webmaster of the website, JamesBoswell.com to assist us in our research. Boswell's catalog is far superior to the other two catalogs. It is everything Samuel Johnson said of the catalog for the Harleian Library. There were problems with the catalog, though. It is not entirely a catalog of the Library of James Boswell, the Biographer. The auction catalog includes books from his sons, Sir Alexander Boswell and James Boswell the Younger as well. The waters get murkier. James Boswell inherited some books from his father Lord Auchinleck. James Boswell the Younger inherited some books from his friend, Edmond Malone, who also had a healthy appetite for books. Hence, one cannot assume that all the books published before 1795 belong to James Boswell the Biographer. James Boswell the Biographer died in 1795. James Boswell the Younger died in February 1822. Sir Alexander Boswell died from a duel in March 1822. The auction was held in 1825. Another problem with the catalog is the number of items which have no purchaser or price realized recorded. In some listings, the purchasing information was mistakenly omitted by the recorder. Several listings were duplicates, but the errors weren't discovered until after the catalog was printed. Purchasing information was omitted on over 20 items because they went missing between the time the catalog was prepared and the time of the auction. James Boswell shared at least 84 books with Thomas Jefferson. I say "at least" because we just finished cataloging our first 1000 books and have another 2000 books to go. Boswell shared 30 books with John Adams, 44 books with Samuel Johnson, 18 books with Charles Lamb and 8 books with me. I recently discovered that not all of the Boswell family's books were sold at the auction in 1825. There was an auction of the Auchinleck Library in June 1893, which consisted of 782 lots. A copy of this auction catalog is hard to be had. One book which is not listed in the 1825 catalog, and which may have been sold at the sale of the Auchinleck Library in 1893 is Boswell's copy of John MacLaurin's Essays In Verse. This copy was lot number 84 in the Catalogue of an Interesting Collection of Rare Books, Autographs and Illustrations Sold in New York by the Anderson Galleries on June 12, 13, and 14 '16. The copy next appears in the auction records of the sale of A. Edward Newton's library in 1941. In 2006, John Crichton at the Brick Row bookshop in California offered it to a Boswell collector who stood before you on this very floor about three years ago: Paul Ruxin. Paul's presentation about the book, “Synonymy and Satire By Association,” was the feature article in the May 2006 issue of the Caxtonian. I don't have any books from Boswell's library, or Lamb's library, or Johnson's library in my own library. But I do have a number of books which identify other collectors who had copies of books from these libraries. Smith's Sentimental Library lists books from all three libraries. Rosenbach: A Biography, by Edwin Wolf and John Fleming identify collectors who owned books from these libraries. A Shelf of Old Books by Mrs. James T. Fields identifies a book from Lamb's library that Edward Moxon gave to James T. Fields. Provenance Research in Book History by David Pearson tells us of unrecorded books from Johnson's library acquired by Charles Burney which are in the British Library. Old and Rare by Leona Rostenberg and Madeleine Stern, tells us of a battered copy of a book from Lamb's library that they found in upstate New York. Four Oaks Library by Gabriel Austin tells us of the books in the Hyde Collection which were from the libraries of Johnson and Boswell. Dr. Samuel Johnson and James Boswell Esq. Bibliography of the Arthur G. Rippey Collection tells us of a book written by Johnson that was reportedly bought at the Moxon Sale and which contains the so-called bookplate, Relics of Charles Lamb. Eighteenth Century Vignettes, Second Series by Austin Dobson identifies a book Dobson owned that was in Johnson's library. It was an edition of Homer given to the surgeon Cruikshank in accordance with Johnson's will. Dobson's essay contains a list of the people who received books from Johnson's library as well as the ten individuals who were permitted to select a book from his library before the auction took place. Both lists were included in the Roberts essay as well. Recently, the George Birkbeck Hill scholar, Catherine Dille, pointed me to another source of books belonging to Johnson: one of Samuel Johnson's letters written to Mr. Gilbert Repington on 18 May 1735, requesting him to send the books Johnson had left at Oxford when he had to leave school. The letter is contained in the Hyde Edition of Johnson's letters. The catalog Johnson mentions in the letter, consisting of 86 books from Johnson 's “Undergraduate Library” is included in A.L. Reade's Johnsonian Gleanings, a copy of which is available for viewing online at the Internet Archive. Finally, I have recently acquired an even greater source of books formerly owned by Johnson: A Preliminary Handlist of Copies of Books Associated With Dr. Samuel Johnson by J.D. Fleeman. This handbook contains books Johnson used to prepare his Dictionary, books he gave to friends, and books which contain his inscription, Sam: Johnson, with a colon between his first and last name. All told, the handbook contains 285 verifiable listings and another 44 listings of doubtful origin. Slowly but surely, Dave, Anna, and I have become more than mere catalogers, taking up Donald Eddy's suggestions on how to identify additional books from these three libraries through research. We, catalogers three, will concentrate our efforts on completing the cataloging of Boswell's library. Then, before we even think of cataloging any other dead people's books, we researchers three, will catalog the additional books we found which were not identified in the catalogs of the Johnson and Lamb libraries. The grandson of Francis Jackson who put the books with spurious Lamb provenance up for sale, would be Richard Jackson, always referred to by Blake scholars as "the mendacious Richard C. Jackson". Some years ago I saw a letter from Jackson allegedly sealed with William Blake's signet ring. (Blake doesn't wear a ring in Thomas Phillips' portrait. I don't think an engraver would.) Jackson also claimed to own books from Blake's library, his chairs, dishes, and clock. I think he also claimed to have owned Johnsonian relics. Thanks for the information notker. I'm familiar with Richard C. Jackson. I have a copy of the portion of the 1923 Goddard and Smith auction catalogue pertaining to his "Lamb" Collection of Books. Unfortunately, it doesn't list the titles. Next time you post, please include a contact address. There is a sale catalog of Samuel Salt's library, in which Lamb grew up! Indeed! There's a listing of the catalogue on WorldCat, but I imagine a copy would be hard to obtain.